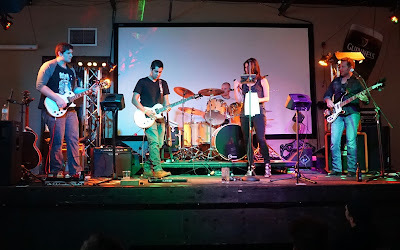 We had a show last weekend at Leatherhead's. Overall it was a positive experience. It was a full house, and we had lots of friends and family come. We were stoked to see our old bassist Ryan Clark come cheer us on. The crowd was responsive and very fun. We sang Happy Birthday to a man, which pleased him and his family so much, they wanted to take pictures with us after the show. The lighting was pretty cool, it was probably the coolest light setup I've had at a show. I personally didn't have any food, but the food looked really good, and everybody said it was delicious. People had burgers, wings, fries, nachos, it all looked really good! We had a person who works for Gallivan's Plaza come scope us out to possibly have us gig there.